Site level data collection is important to document how population enhancement efforts are affecting the ecological health of a reef site. In addition to assessing and tracking the success of individual outplanted colonies, it is important to know whether outplanted corals are positively affecting other organisms in the site and promoting better ecological functioning and processes. Thus, it is suggested that monitoring of a restoration site be conducted before and after outplanting occurs, so that any changes in the site can be attributed to the specific intervention of coral outplanting. Another reason to monitor larger reef areas is because current methods for monitoring individual corals long-term can potentially give inaccurate information, particularly for branching corals (e.g., Acropora spp.). For instance, recent research shows that after ~2 years, outplanted branching corals become so large that they fragment or become dislodged – a natural process for wild and restored colonies. ref Individual colony tracking methods may therefore count a dislodged or fragmented coral as dead or missing, when it may have actually given rise to many more colonies located elsewhere in the reef site. Thus, long-term data of individual outplants may show lower success than is really present at the site. There are several large-area survey methods for obtaining this data, including newer technologies such as photomosaics, swimming with GPS to gather waypoints of corals, and more traditional survey techniques using quadrats and transects. Limitations of colony-level monitoring for coral reef restoration sites. Credit: Elizabeth Goergen, Nova Southeastern University. 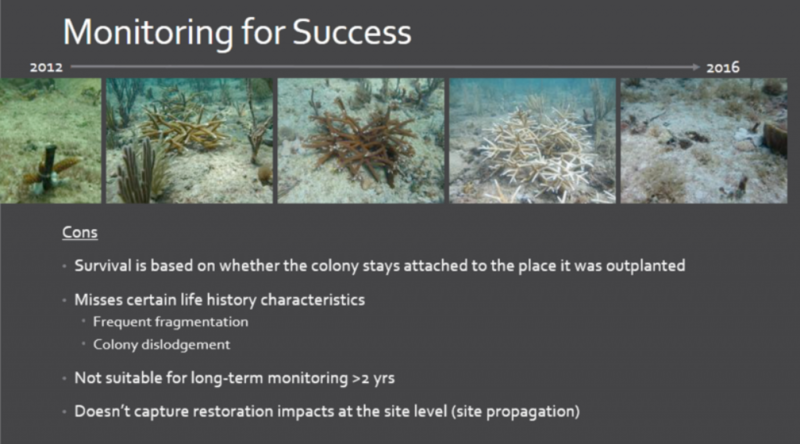 Slide from 2017 Coral Reef Task Force Meeting.